Great gift for your wife, daughter little girl or husband! Or whoever you want to make feel special and loved! If you don't say this every day to them, let these little pears do it for you. Three of the most darling little pears you will ever lay eyes on. Handmade by moi, and then stamped with words. I don't ever use molds or templates to make my sculptures, they are totally handmade from start to finish by me. Made of polymer clay and painted, and finished with a coat of high quality clear varnish. 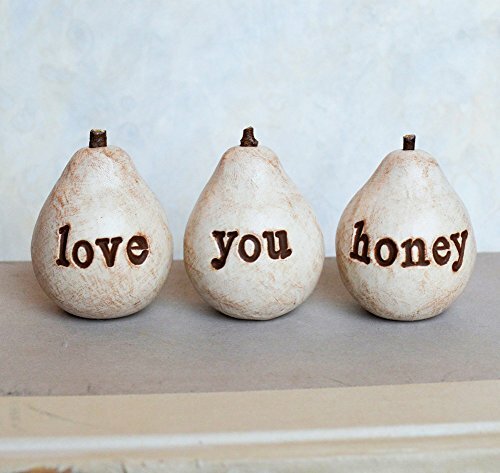 You are purchasing all three mini pears. If you have any questions about this product by SkyeArt, contact us by completing and submitting the form below. If you are looking for a specif part number, please include it with your message.